I made my first one in a chambray fabric shown below. In theory it worked out nicely. Pretty fabric, a quick sew with a nice professional finish both inside and out. However, it’s not my favorite because the fabric is too heavy for the drape I prefer to wear over my 47″ hips. But I LOVED everything else about the pattern. So, I gave it a go again and changed up a few things. • Made in a lightweight woven fabric- rayon challis. • Cut out the size L 12-14 as suggested on the pattern since I wanted to wear it on my natural waist. • Cut a few inches off the suggested elastic measurement so I could wear it on my natural waist. Make sure that at it’s most stretched out point you can still get it over your hips! • This version I absolutely LOVE! I paired it with a black tank top and an old cardigan I had in my closet and tied it in the front for a super cute and comfy outfit. 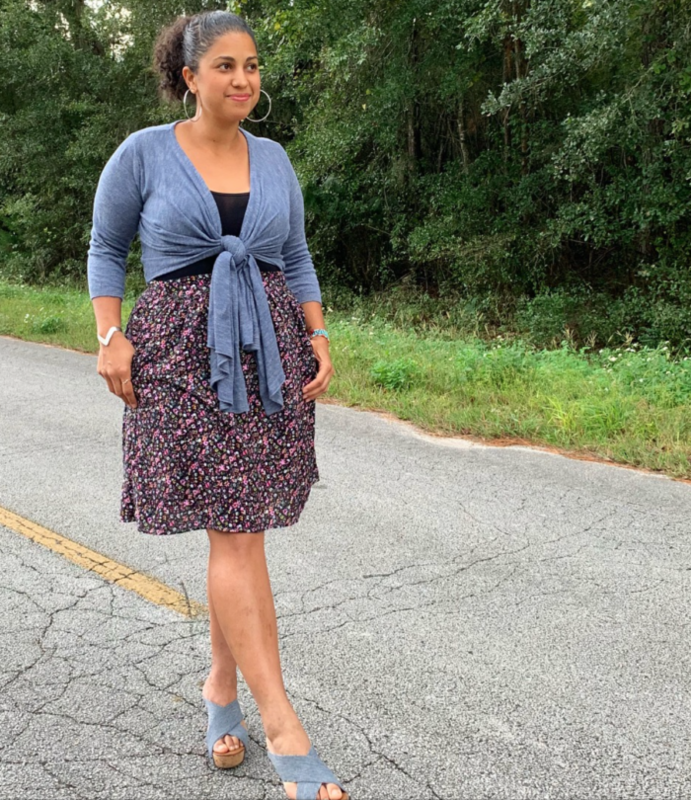 • This skirt has pockets! Every skirt/dress should have pockets, right?! • The pattern includes women’s sizes 0-16. According to the Liesl + Co. size chart it will work for dropped waist (1.5″ below natural waist) measurements of 27″ – 36.5″. Pattern is designed for hip measurements between 35″ – 44.5″. I will say my hips measure 47″ but because there is plenty of room in the skirt I was okay. I made the size XL 16 and was able to even size down and make on in the size L 12-14 also. So, if you’re hip measurement is up to 49″ I would encourage you to give it a go! • The front of the waistband lies flat against your body because it is made from a strip of fabric that is interfaced. • Front of skirt (just below waistband) is gathered. • Back of waistband is elasticated allowing for easy pull on and off of the skirt. No zippers. No buttons. 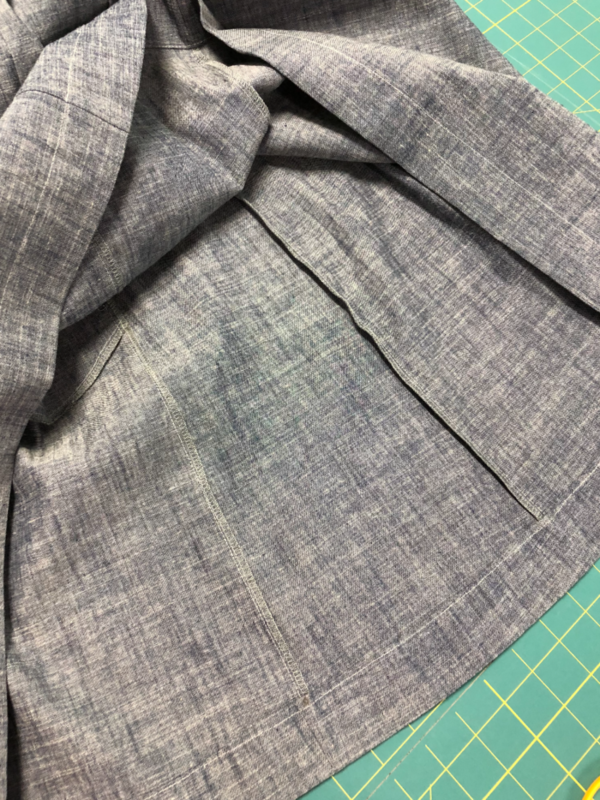 Note: If you adjust (shorten) the waistband measurement so you can wear it on your natural waist (higher than where the skirt is designed to be worn) then be careful not to take too much off at the waist otherwise you may not be able to get it on. In other words, make absolutely sure that when the elastic is fully stretched out that it measures larger than your hips. Otherwise you won’t be able to get it on. 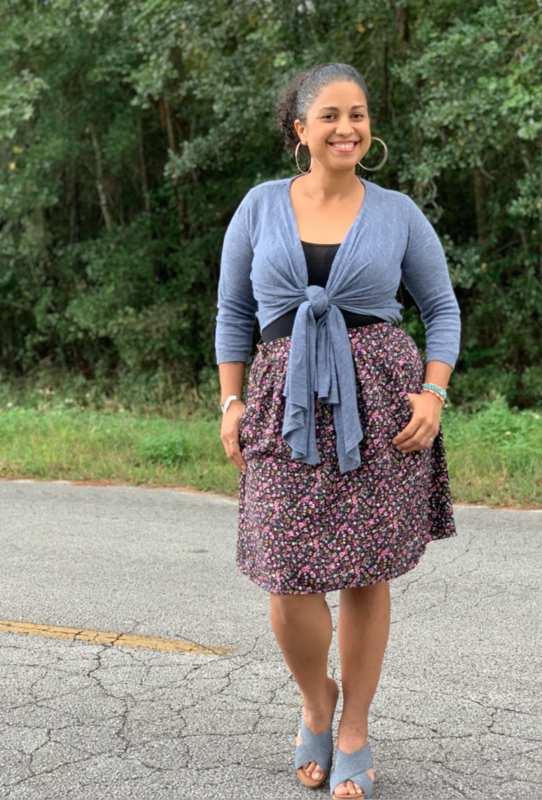 • As the pattern suggests if you want to wear the skirt at your natural waist then you can probably size down one size. I did this and it worked great for me! So, even though I was to cut out a size XL 16 I had great results cutting out one size smaller (L 12-14) to wear on my natural waist. 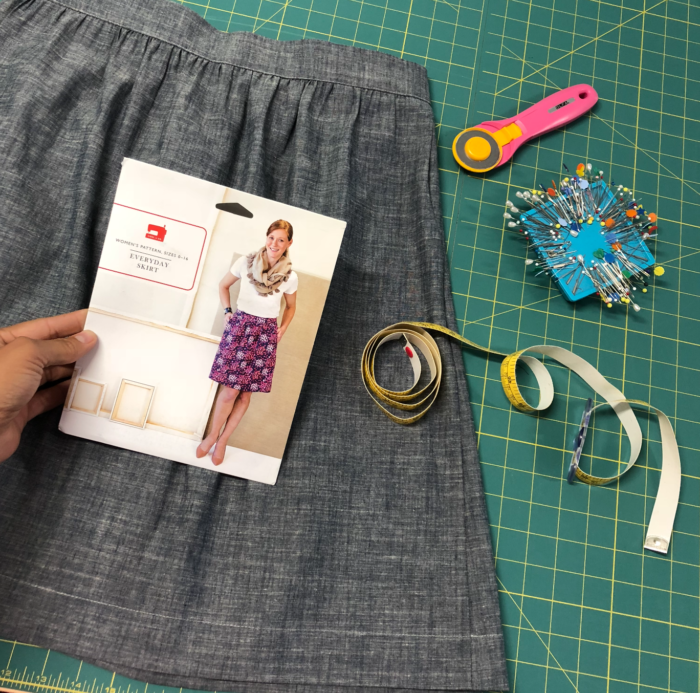 • Pattern includes finished measurements for the garment. Great to reference so you choose the size you want to make. Look at the inside! Impeccable finishing techniques. Note: I used my serger to finish off the seams but that’s not necessary. You don’t need a serger to get a clean finish. So, don’t let that hold you back! You are so much fun. I love the sewing you post. You have great ideas. Thank you.